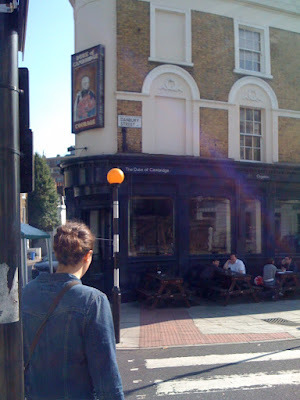 If there can be any such thing as a "pariah gastropub", then it's the Duke of Cambridge in Islington. 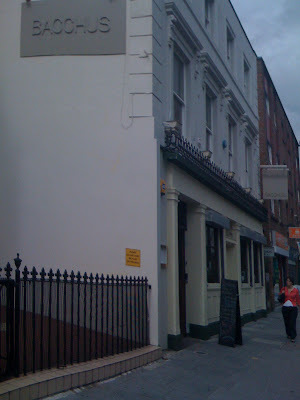 Opened as the UK's first 100% organic gastropub in 1998 it remains a solid, dependable place for a bite to eat but for some reason has in recent years attracted the kind of vitriolic backlash from foodies normally reserved for £95 burgers or when Delia "goes cheat". 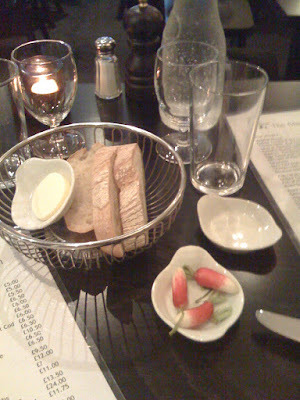 Part of the reason could be that while other food pubs in the capital have matured into rustic French restaurants or gone all "St. John" and started serving spleen and chitterlings, the menu at the Duke has remained steadfastly gastropub-traditional and is aimed squarely at wealthy Islington locals - think Feta Salad, mushroom risotto, Italian sausages - safe, comfortable and familiar. Not that there's anything wrong with that in itself, but the problem with limiting yourself to all organic ingredients is that you suddenly find you have to charge £15 for rabbit stew to make the numbers work. 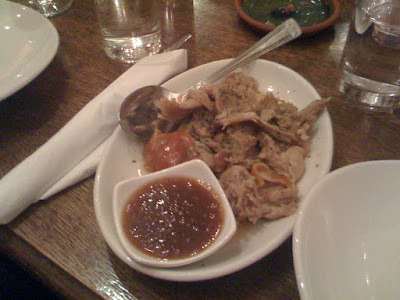 It was a perfectly good rabbit stew - good deep flavours and a nice variety of herbs and veg, if very slightly overcooked rabbit meat and a bit tricky to dissect from the many tiny bones - but all the while there's that nagging knowledge that rabbit is vermin, and a very very cheap meat, and charging £15 for a stew that basically involves chucking the carcass in a big pot with some bay leaves and veg and boiling it for an hour is, well, a bit cheeky. Fortunately, the reason for my journey to Islington wasn't only to visit the Duke of Cambridge. I was just after something to line my stomach on the way to Beer Exposed, a drinks festival billed as a different approach to beer and beer tasting and organised by an old acquaintance of mine, Des Mulcahy, whom I first met backpacking in Hong Kong all the way back in 2001. He and his colleague Matt Roclawski have scoured Europe and the world for the finest small producers and microbrewers and invited them all to set up shop in London's Business Design Centre to show us ignorant Londoners how beer is supposed to taste. The contrast with the awful, cynical Toast Festival in Olympia the previous night couldn't have been more stark. On the way into Beer Exposed you are handed a tasting glass, which you use to get free (and often quite generous) samples from all the stalls in the festival. You pay extra for nothing, unless you are so taken with a particular brew you wish to purchase a crate or two to take home. And the range and quality of the drinks on offer at Beer Exposed are so high, and the passion and knowledge of the producers so infectious, that I'm willing to bet that happened quite often during the course of the weekend. Organised throughout the day were talks and presentations from beer experts on a variety of subjects. 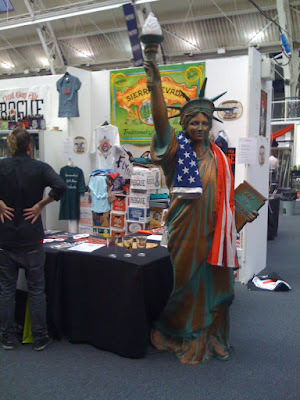 We tagged along with a talk about the way hops are used in beers in the UK and abroad. It seems the story of artisan beer has parallels with that of old world and new world wines - namely that Europe started them off, the US took our processes and combined them with their superior raw ingredients, and now we're learning off the Americans and upping our game too. We learned about the International Bitterness Units scale and how different beers use the hops to different effects, balancing them either with a greater alcohol content (the sweet alcohol balances out the bitter hops) or by using a blend of different hops for a more complex taste. It was fascinating stuff. It's all too easy for these festivals to turn into a corporate brewery trade fair, and the scale of the achievement of Des and Matt in resisting the pressure and money from the big boys and instead creating a gathering of unique, characterful producers is extraordinary. I'm sure that everyone that took the time to visit Beer Exposed has found a new favourite beer - I found about ten, special mentions going to Thornbridge brewery and the porter from Meantime. 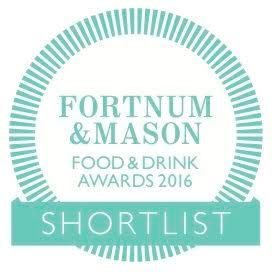 And if you didn't manage to make it this year, then keep an eye open for next. It'll be a sell-out, in a good way. I received an email on Friday morning inviting me to Toast, billed as a three-day food, wine and music festival at Kensington Olympia. Actually, I wasn't invited as such, I was encouraged to win a set of tickets by answering one of those ITV-style easiest-questions-in the-world and handing over all my personal details. Having nothing better to do of a Friday night (shocking, but true), I signed up and wasn't in the least bit surprised to "win" 2 tickets to the Friday night Australia day. After work, I toddled along. I wasn't sure what to expect, and I did have an open mind, but I can honestly say I have never been to a more cynical, soul-less, depressing, corporate ripoff-market than Toast 2008. 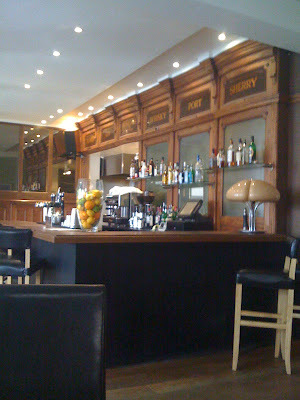 In the vast, echoey chamber of the Olympia were a handful of poor outside caterers, mass-market high-street wine merchants (Wolf Blass, Jacob's Creek) serving wine costing more for a glass than you can get at Tescos for the bottle, convenience food (shrink-wrapped sausage rolls and £10 factory pies), and many other usual suspects of these consumer fairs - paintball stands, novelty t-shirts, you know the drill. It took about five minutes before we lost the will to live and rushed back outside, leaving a poor Australian singer on the main stage serenading a crowd of about ten. 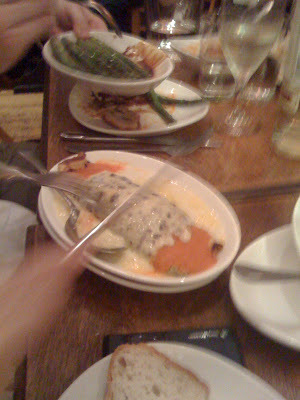 Desperate to redeem the evening, I gave my Urbanspoon iPhone application a shake and found Popeseye, a steakhouse hidden around the back of the Olympia, and so pushing past the touts offering tickets to unsuspecting punters that you could presumably have even by then still picked up from the website for free, we crossed our fingers and made our way. Without exception, the only truly great steak houses that I have ever visited (Luger's, Hawksmoor, Strip House) have made a virtue out of their limited menus. At Luger's, they prefer you don't even ask for a menu, and instead order "steak for four" and hope for the best. Even at Hawksmoor, where, as a rather patronising concession to non-carnivores they offer one fish and one vegetarian dish, the menu is short and direct - beef steaks in three different varieties in two different sizes, alongside lamb and pork. Sides are extra. A proper steakhouse should be all about the steak, and if the item you are ordering costs anything less than £20 and sits alongside Chicken Kiev or Crab Tagliatelle on a large menu, be warned. With this in mind, the menu at Popeseye in Kensington reads like a steak-lover's dream. Three different cuts of meat each served in five different sizes, and that's it. Chips come whether you like them or not, and the only additional side is a £3.95 bowl of salad. It is a menu that quite simply has everything going for it, and it was therefore all the more of a crushing disappointment to eventually taste the food. 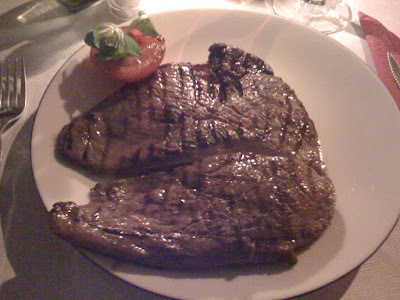 My £18.45 12oz rump steak was first of all cut incredibly strangely - it looked like two huge lobes of liver flattened out to cover the entire plate. Being so thin it was, of course, overcooked, and though not tough the poor quality meat hadn't contained enough fat to create a good char, and instead was just bitter and burned in places. 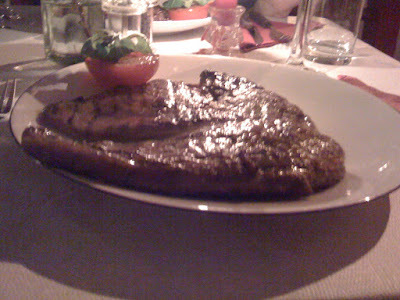 A friend's 8oz rump was thicker and therefore more easily medium-rare but still of the same poor quality, tasteless watery meat. The menu proudly claims the beef is hung for two weeks and is from 100% Aberdeen Angus cattle, but then you can get an Aberdeen Angus steak from Burger King these days and they taste like crap too (in the interests of research, before you say anything). Accompanying chips were bland and insipid, the kind you would get at any high-street pub. So essentially we have a steakhouse that serves literally nothing but steak, and can't cook steak at all. I can't explain the good press this place has been getting (the door is plastered with the usual Timeout awards) but I can say that for more or less the same price you can get a dictionary-thick slice of 28-aged sirloin that will blow your mind in Hawksmoor at the other end of town, and a beautiful cup of triple-cooked chips that rank with the best in the city. 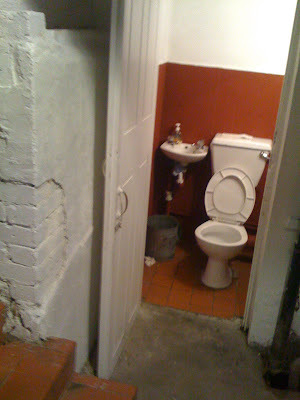 Oh, and their toilets are indoors, which I'm guessing would make them more appealing in February. After the violation of Popeseye, and the awful experience at Toast, I was even more apprehensive of my upcoming visit to Beer Exposed in Islington on the following afternoon. As it turns out, I needn't have worried and the two events literally couldn't have been more different in execution, attitude and passion. But that, my friends, is another story. A restaurant surely couldn't want for a better set of reviews than those achieved by The Giaconda in its opening month. 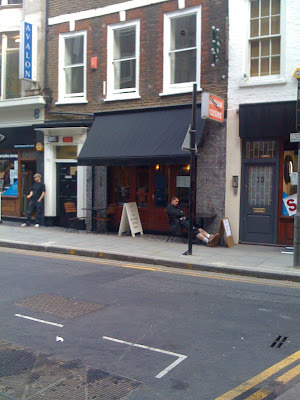 Timeout (*****) and The Guardian joined a growing set of bloggers and foodies to lavish praise on the Soho eatery. At first glance, it's hard to figure out what the fuss is about. 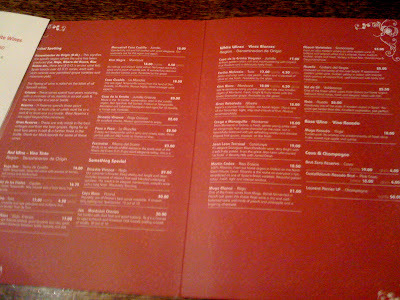 The menu reads well enough I suppose - a mixture of Mediterranean and British-inspired dishes including such choice items as foie gras and rack of lamb for two. The room is tiny but pleasantly lit, and the man and wife team that handle the kitchen and front of house respectively are clearly confident and accomplished in their respective roles, but it's hardly the kind of thing we haven't seen before in the capital. What has people excited, I think, is that as the economy continues to tumble and even those lucky diners who aren't feeling the pinch are at least encouraged to feel guilty about it, it is becoming common for reviewers and critics to highlight that extra element of value for money in their overall appraisal of a restaurant. Tayyabs, for example, has been around for the best part of 30 years but the reason it won Indian Restaurant of the Year in 2008 was because people have finally come to their senses and exposed the folly of Indian Fine Dining (Benares, Amaya, et. al.) 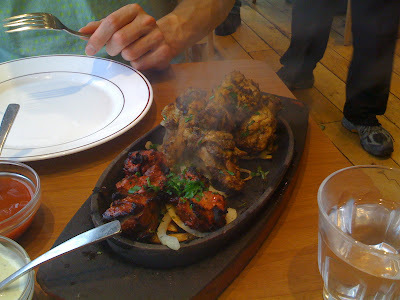 - why pay £30 for Chicken Tikka in Mayfair when you can get it for £1 in Whitechapel? 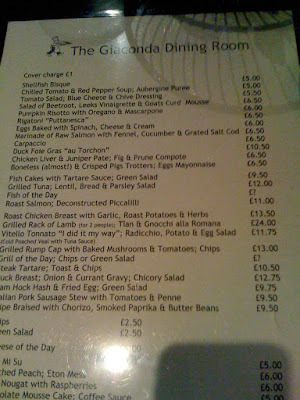 And The Giaconda not only serves very reasonably priced food and cooks it well, but all the wines are marked up the same amount, meaning there's barely anything on the list more than £30 a bottle, and a £1 cover charge (something I usually hate) gives you bread and butter, an endless supply of still or sparkling water and a little bowl of radishes to nibble on while perusing the menu. In short, The Giaconda may not be the cheapest restaurant in London but you genuinely feel you're making your pennies and pounds go as far as they possibly can - something guaranteed to win over hearts and minds in these post-credit crunch times. Despite having mentioned how tempting the menu was, I managed to order two courses not even on it. 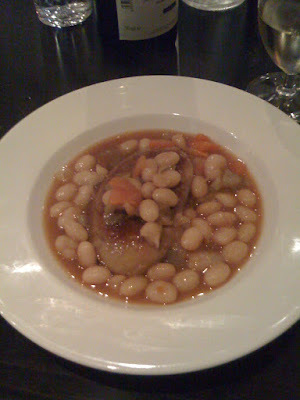 The foie gras "au Torchon" was replaced by a seared slab of lovely creamy foie in a rich butter bean sauce, and was absolutely heavenly. I have rarely had better cooked foie gras in the top restaurants in London, so at £10.50 for this generous portion, cooked to perfection, this was an absolute bargain. My main course, unfortunately, was less successful. 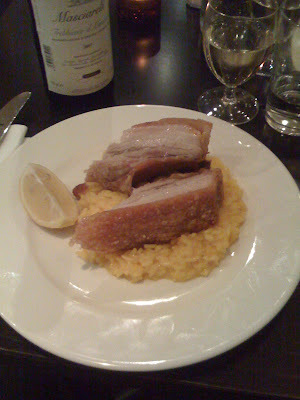 An admittedly generous amount of pork belly, moist and cooked very well, was presented on a thick, creamy risotto which did nothing to offset the fatty pig meat and about two mouthfuls in became a chore to get through. I did my best to clear the plate (I'm such a trooper) but when I actually started to feel physically sick from all that richness I had to give up. A companion's plate of salmon looked a bit slimy and didn't have the texture of a great piece of fish, but was cooked well with a nice crispy skin and the "deconstructed piccalilli" was a good sharp accompaniment. We also ordered a side of chips, which were pretty good, too. I am willing to believe I chose badly as better people than me have raved about their meals here, but as the only plate of food to actually make me nauseous for as long as I can remember, I must deduct points for that. The Giaconda's final nod to the diner on a budget is to leave the service charge off the final bill. True, it does say in rather threatening capital letters SERVICE NOT INCLUDED underneath, but it's still nice that they leave the tip up to you rather than slapping on the customary 12.5%. We still tipped 12.5%, as it happens, as the service had been very good, so everyone's a winner. In fact, the "trick" with the bill neatly sums up my experience in this restaurant. The food wasn't top-class but in doing various things just well enough and managing to make you feel you're getting the bargain of a century whereas you're just in fact getting a decent meal at gastropub prices, it satisfies your soul as well as your belly. They've even managed to get a cover charge out of me without the usual accompanying rant, so for that alone they deserve all the praise they can get. My, how time flies. 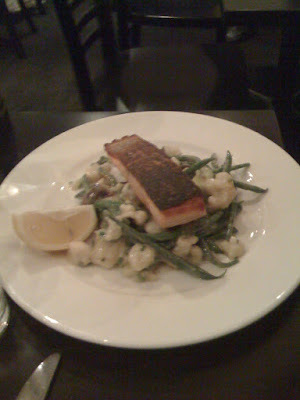 I can hardly believe it was all the way back in March last year that I visited Bacchus, the experimental molecular-gastronomy restaurant housed in a refurbished pub in Hoxton. I had a spectacular, challenging meal, served by attentive and intelligent waiting staff and spent the next 18 months vowing to return soon. I never did. The reason I never made a repeat visit was, of course, location, location, location. As a Battersea resident, for the time and effort required to make a return trip to Hoxton you might as well go for a meal on the Moon. But unfortunately that wasn't the only thing putting me off - you must believe me when I say there are very few areas of the country I consider to be obstacles in the way of decent grub; I spent the first 22 years of my life in Liverpool, after all. But after our lovely meal at Bacchus we spent much of the remainder of the evening at a friend's flat two doors down watching two people beat up each other (and various unlucky parked vehicles) with iron bars. I got a taxi home, and my friends have since moved to Stoke Newington. 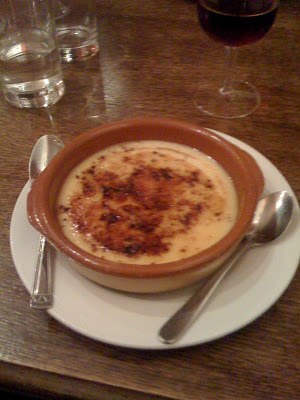 Now, finally succumbing to market forces and the fact that a large majority of the fine-dining crowd do not consider carrying a bullet-proof vest and tazer to be the hallmarks of a relaxing evening out, Bacchus has relaunched as Bacchus Bar & Kitchen, and swapped foams for gravy, sous-vide for shepherd's pie, and Nuno Mendes (visionary gastronaut) for Richard Tewnion, formally of the Pig's Ear in Chelsea. At first glance, little seemed to have changed inside Bacchus. It was, after all, a fairly relaxed space already as fine-dining rooms go, and with the addition of a couple of trendily battered sofas and a more accessible bar area, it now has completed an easy transition to a gastropub. 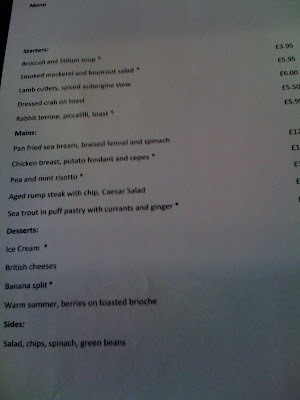 The menu was pleasing in its Britishness - crab on toast, pea and mint risotto, sea bream and spinach - all tempting stuff. 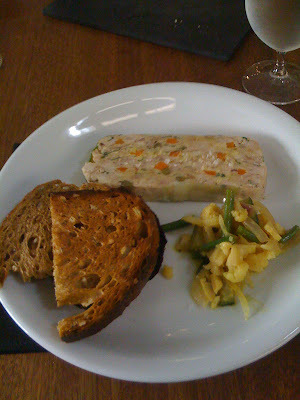 My first course was a rabbit terrine. The generously portioned terrine was rich and hearty, shot through with just enough summer veg and sprinkled with salt to give it that extra burst of flavour. I wasn't hugely enamoured of the accompanying piccalilli (rather under-vinegared and slightly on the sweet side) but given that this was made in house I am willing to give them time to improve on the formula. 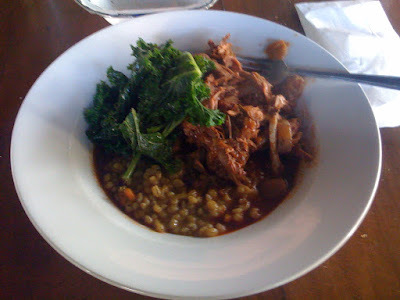 This was a very successful dish and worthy of any top gastropub in the city. Next was "chicken breast, potato fondant and cepes", and the first thing to grab my attention was a heady note of alcohol rising up from the plate. The chicken was attractively sliced and with a nice crispy skin, and the mushrooms weren't overpowered by the stock and alcoholic (possibly sherry) sauce. Although not a fondant as I would know one, the potato was well seasoned and arranged in a sort of mini-gratin beneath the chicken. 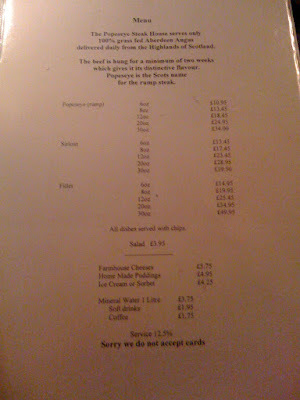 The best was yet to come - the bill, which was an astonishing £10 each. Given that these were two substantial and satisfying courses, we just didn't have room for dessert, but if we had they would have cost us an extra £3. We were even offered tea & coffee on the house, which we politely declined in a rush to get back to the office before our lunch hour was up. An extraordinary bargain - and I'm told one that probably won't last too long - so it's up to you to make the most of it while it lasts. Even if Bacchus hadn't been the lunch bargain of the century I would have still had a very good meal; at £10 a head this is unbeatable. 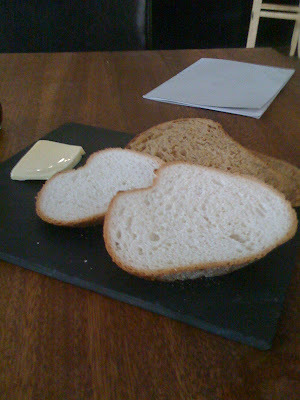 A trend has been developing over the last few months; it seems the less I spend on a meal the better it turns out to be. 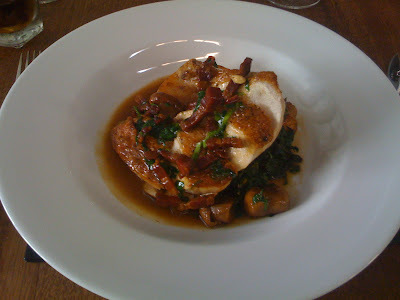 Of course I want everyone that can to go to Bacchus and have the best food you can get for the money in north London, but that was true of the old Bacchus as well. Whether their revamp will start attracting punters to the badlands of Hoxton remains to be seen - what is very clear even at this stage, is that if you do make the effort, the rewards are immense. Well, you could have knocked me down with a poppadum. For weeks, if not months, a friend of mine had been trying to persuade me to try Mirch Masala on Commercial Street, and of course I thought the very idea was insane. 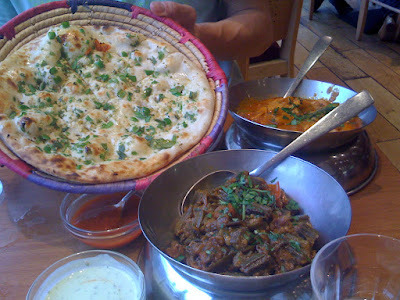 "Why on earth," I would say, "if I was going to eat anywhere in Whitechapel, would I go anywhere other than Tayyabs?". And given the sheer consistency and quality of the food there, I think you would agree I had a point. But more recently the buzz of recommendations for Mirch Masala had reached a even more deafening level as I learned a couple of colleagues at work at been and declared it (brace yourselves) "possibly" even better than Tayyabs. So that was that - on Friday evening I wandered down. The menu was reassuringly Tayyabs-like in style, though perhaps slightly more extensive with a much larger vegetarian selection and some interesting Karahi options. We ordered a plate of sizzling lamb and chicken wing tikka, and on arrival you could immediately tell this was a kitchen with a supreme command of the grill. They were - and it almost pains me to say it - every bit as good as the grill from Tayyabs, succulent and salty and dripping with fantastic tandoori spicing. The chilli naan was decent enough (nothing has yet beaten the garlic naan from Lahore over the road in my book, it's just a shame everything else there doesn't live up to it) but the Masala Bhindi was amazingly rich and meaty for a dish containing no meat, and the Karahi Chilli Chicken, despite containing slightly dry pieces of chicken, had such a wonderful tomatoey, herby sauce that I almost licked the bowl clean. Great stuff. So, and here comes something I never thought I'd say, Mirch Masala may have done enough to replace Tayyabs as my curry house of choice in the East End. It's not just because of the food, either - although Mirch will certainly give them a run for their money. The problem is, thanks to people like me going on about how good Tayyabs is, it's more or less impossible to get in these days unless you turn up at 5:30pm or are willing to wait for two hours. And once you're in, securing a spot with enough room to use your elbows and not have people knocking you on the back of the head on the way to the toilets is yet another challenge. 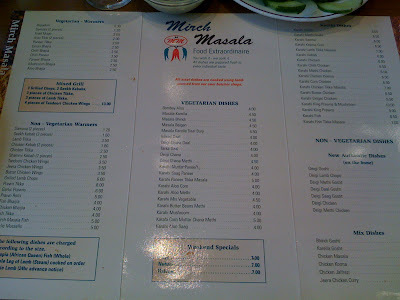 Mirch Masala serves tasty, cheap food (our feast for two came to £19 in total) in infinitely more relaxed (if rather canteen-y) surroundings and is a big enough restaurant that you don't have to sprint there after work to get a table. It has everything going for it. Let's just see how long it takes for the rest of the city to catch on... can you keep a secret? You can do all the research in the world, scour every website, read every blog, but very often there's nothing better than a spot of hands-on local knowledge to point you in the direction of a good meal. 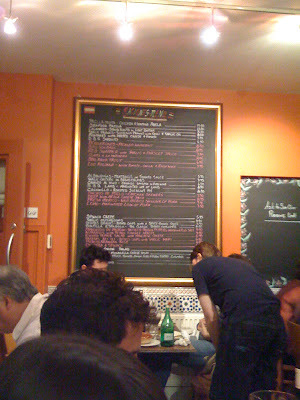 A friend of mine who's recently moved to a pretty little spot just off Columbia Road in Hackney had been raving about a Tapas restaurant called Laxeiro he'd had the good fortune to stumble across, and so on Saturday night we duly trotted off there to see if it could deliver a second time. It's a pretty small room and it didn't take very many people to become crowded and boistrous, so the noise levels at first seemed excessive. However once we'd settled into our couple of bottles of Spanish Viognier I imagine we were giving as good as anyone. Only the wine list was printed; the food menu was on a chalkboard near the door which I would hope demonstrates a use of fresh and changing ingredients - only repeat visits will tell, I suppose. Given that there were six of us and I think I speak for everyone when I say that we would have all happily eaten everything on the menu, we managed to get through about half - about fourteen(!) or so dishes. 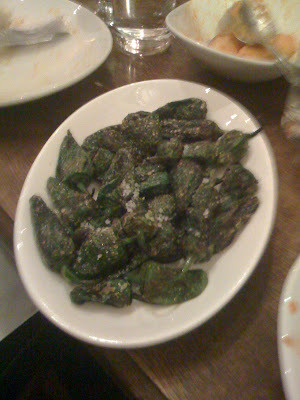 I'm not going to attempt to list in detail everything we scoffed, but particular highlights included lovely fresh BBQ sardines, salty Pimientos de Padron, a superb dish of moist, fatty suckling pig and a smooth and light Crema Catalana. 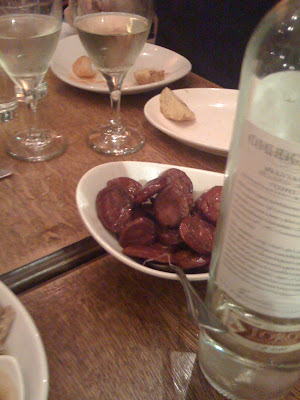 Dishes which didn't work so well were some rather dry cubes of deep-fried chicken in breadcrumbs, some greasy and bland Patatas Bravas and a plate of Chorizo in Red Wine sauce which was not bad by most standards but suffered badly in comparison with a truly delicious dish I'd had at Café Kick in Exmouth Market last week. Charming Spanish waitresses never got flustered despite our increasingly drunken demands, and the evening passed in a happy, noisy blur. We did of course manage to spend far more than we'd intended - tapas dishes have that particular psychological disadvantage of making you seem like you're ordering carefully then before you know it you've eaten half your bodyweight in Albondigas and spent £50 each. 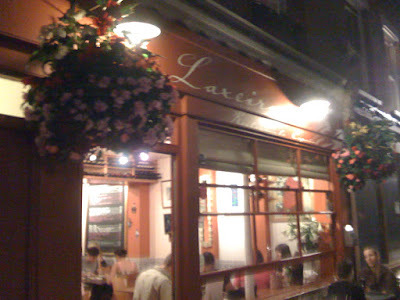 But what the hell - Laxeiro turned out to be a quite excellent little local restaurant, and I can't wait to go back.